December 10 – 15, 2018: The Last Traverse. 5 Days, 490 Km travelled with the Hilux, 3 sampling sites visited, and our mission has finished.. Happiness of all we have done and achieved in this short stay in Antarctica but a bitter flavor at the same time. Day 1 -December 10: 15 hrs trip travelling in Caravan to the waypoint where we will settle the camp shared with the glaciologist group from Belgium. Yes, it was a very exhausting, long and a very very slow drive (9km/h). But as you can see on the pictures: we were taking a lot of equipment. We arrived at destination 1:00 AM in the morning, all thrilled, sleepy and hungry. So, in less than 15 minutes the field guides settled up 8 tents to sleep in groups of 2. Usually you will have your own tent, but the tiredness is so much that for the moment nobody complains. We all just need some rest. By the time we went to bed it was already pass 2 AM and the alarm for the next morning is in 5 hrs. Day 2 – December 11: After only 5 hrs of sleep, the faces in the Kabobs Kitchen are not the friendliest ones. 😉 but we managed to have a nice breakfast. We are so many that we even need to take turns to eat or whatever we want to do in the kitchen. So, to keep everybody happy, organization is the key in here. The plan for us is to reach our next sampling site: ~35Km in the coast direction. With the Hilux, this might take up to 4 hrs. After a couple of technical issues with the Toyota and more than 6 hrs since we left camp, we can see from the distance 3 bright little things, the dust collectors, shinning like diamonds in the sky! The landscape around is just breath-taking. We can see the ocean from here! 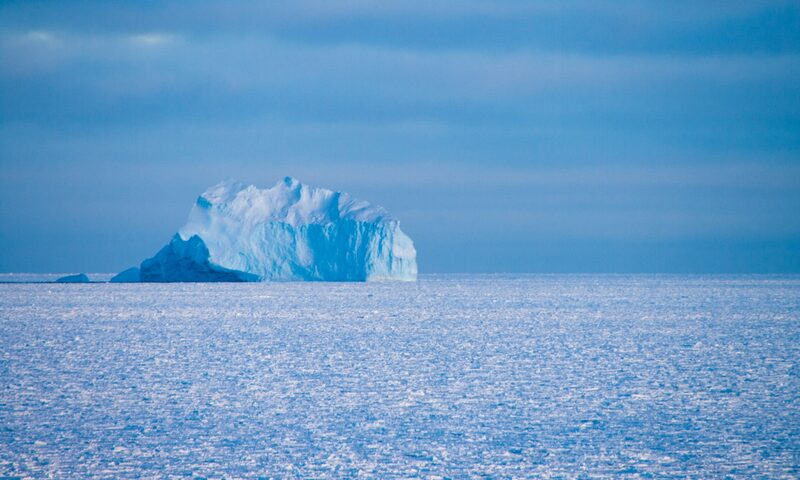 The mix of colors is beautiful; the clear blue of the sky hidden in the white clouds, the dark blue of the ocean with the icebergs floating in the distance and the ultra-bright white snow is just incredible. One more day has passed. We are back to camp. It is late, almost midnight. Everybody is asleep. Silent is the owner of this place. The only thing you can hear is the wind blowing against the tents. Off to bed I am! Day 3 – December 12: Waypoints already in the GPS, it is time to go. This is the furthest place (sampling site) we will go. We have a long day ahead us. This is another new place where we have to set up our dust sampling systems. With this new site, we now have a total of 7 sampling points across a 230 Km transect. Congratulations for us! Record on time. In less than 3 hrs we have finished, and we are ready to make our way back to camp. No rush, it is still early so if we can make it by dinner, we are all happy. Day 4 – December 13: Last sampling station to visit and we are done! It’s only 15 Km away from the base camp. A piece of cake! Except the visibility is 0. Driving blind in a white out in Antarctica is not easy. Not fun either, so you better stick your eyeballs to the window and try to find the old tracks in the terrain to make this final traverse enjoyable. Good luck with that and an extra beer tonight for the first who is able to see it! And don’t forget to hold you tight or scream loudly “depression up front!” if you don’t want your head to be smash in the roof of the Hilux. Now the tricky part. How we will be able to see the poles? Usually we always stop 300 m before the waypoint to avoid contamination but in the middle of the white out that is definitively a challenge. But we are team and as in any other, we have a goal, so splitting tasks to maximize our search. We decided, one will focus the view on the front. Other to the left and the other one to the right. After an intensive search, Bingo! They there are! 🙂 Wind is blowing hard, so let’s hurry before our fingers freeze. Back in base, soup and a half-frozen sandwich for this late lunch is what we have. And not relax or get comfy too much because we still need to organize and load the truck for the 10 hrs. return trip to the station tomorrow. Day 5 – December 14: 6 AM in the morning alarm off! get up get up, we gotta go! Last breakfast with some of the glaciologists who are already up. Next thing to do, undo the tents. Well in reality the first thing is to dig out the tent from the huge snow pack accumulated during the night with the wind. After 3hrs of work and preparation and wrapping the Zarges boxes with all the equipment on the Hilux, now is official… we are leaving … I don’t like to say goodbye, but we leave the glaciologist camp very thankful to everybody! All the best for the rest of your mission folks! 8 hrs later and a very bumpy and bouncy trip, we are home again! And the welcome for us is with pizza and beers. Thank you to the ones we prepared this delicious meal from scratch! After a previous failed mission to Romnoes, today seems to be the day for! So, here we go, second chance for us. Total Travel Distance: 125 Km. Estimated Time: 9 hrs. Vehicle: Skidoo. Henri (Station’s Assistant Manager) is waiting for us outside to record and capture in pictures our departure. “All the best folks” he said, while we slowly left the station. After a long period of bumps on the skidoo, the discover of blue ice was just fantastic! When driving in Antarctica there are certain rules. You always should drive in one line, keeping a prudence distance from each other and checking behind for the rest of crew. The order was always Manu opening in the front, me in the middle and Preben closing the line. But well like any other law, I suppose there is always an exception, right? Suddenly, I lost Preben. He was not behind me anymore … he was there, somewhere enjoying the drive on the blue ice like he was in a rally car race! He had so much fun! Me, forget it. I don’t have the skills. I was just too focused not to slide or turn over the skidoo, because there are not stable as they look like. After the “blue race” on the ice we reached our site. The weather is almost like beach weather for Antarctica. Pretty warm, so very nice to do our job. Everything went according to the plan. Samples recovered, replaced by new ones and once again we are done! Time to come back home. In our way back, Alain, the manager of the station called on the radio and invited us to make a quick stop at Perseus. A new site where part of the construction station’s team is working for a future airplane landing area. It is quite impressive to see these huge machines and trucks removing snow from one side to another and building things in such in hospital place. Thankfully for the visit and the warm welcoming coffee we must continue; PEA is 60 Km away. It is already the afternoon, so better keep moving if we want to be on time for dinner! A couple hours later… 7:55 PM, just 5 minutes before Christine’s bell rings to announce dinner, we arrived sound and safe! No time for clean up or organize the stuff we brought back from the field … it’s time to run upstairs, grab a plate and wait in queue before the food is gone! We are more than 30 people now, so rather be the first than the last one! Digestive tea after the delicious Lasagna and off to bed we go because in two days the greatest traverse of this mission is coming. After being on the Antarctic Plateau, I promise I won’t complain about cold anymore. 9 AM UTC Time, the Hilux fully loaded with the necessary stuff and not 3, but 4 Musketeers ready for the next adventure! 65 km to our final destination. On a regular route you will probably cover this distance in less than an hour. In Antarctica, 4 hrs. We can’t go more than 15 Km/Hr. Skidoos are faster, but we are not warm, we can’t talk, and for sure they are not that comfy. So, well the “slow motion” is worthy then. Around 1:30 pm we reached the first sampling site. -18C. Cold, of course, but not bad. With the help of Henri and Manu, we get to work. We can’t spend too much time here because we still have a new sampling site to go to. It’s only 16 Km away from this one, which means ~1 Hr driving if we are lucky and the terrain is in good condition. After almost 2 hours, we’re done here, and we begin our trip to the next point: The Deep Plateau. The landscape is just incredible, and the more we drive the more I notice and feel the difference. Katabatic winds blowing harder, temperature decreasing pretty fast to ~-23°C and voila! here we are, in the middle of nowhere. To the side, you turn your head and look at the most beautiful flat, white and bright 360 panorama you can ever imagine. Before getting out of the car, two very important things. Number one: organization of all the tasks to do. Each of us is responsible for doing something different. That way we can achieve the goal efficiently but quickly due to the low temperatures. Number two: (but this one is just for me) to be ready with the “ultraclean outfit” in order to minimize the contamination of the samples as much as possible. Being aware of the chilly temperature, hand warmers are in between my two gloves, but I was not prepared to be blasted by the wind! In a matter of seconds my vinyl gloves were completely frozen and, with that, my fingers as well; the -23°C feels like -30°C! So, I ran to the Hilux to take the gloves out and replace them with regular plastic gloves. I am sorry for science in this point. But if I lose my fingers now I won’t be able to complete my mission in Antarctica and so far, we only have 3 out of 7 sites done! Safety first. While I’m sampling snow, my folks are installing the three new poles we need at this new site. Two for the organic compounds and one for the inorganic materials. We all finished almost at the same time. So, either I took a long time for the sampling or they did their job very fast. 6:30 PM and we’re finally done, high fives for the 4 of us. Nice freezing job! But the satisfaction of seeing our samplers set up is a great feeling. It’s not easy to work in extreme conditions but always possible when even the small details were triple-checked before going. After another 4 ½ hours we’re back home. Princess Elisabeth station is so quiet because it’s almost midnight and the whole crew, except us, is asleep. Christine has left 4 plates ready with dinner for us on the counter in the kitchen. That was so nice of her. Unpredictable, changeable, variable, unstable. All in one. But seriously how bad it could be? Well, pretty bad indeed. Awful and very frustrating. The morning of Tuesday November 27th, was so much productive for us. Not because the weather was good but because we managed to finish the installation of 3 active pumps, for both organic and inorganic compounds. Preben came up with a very smart idea to improve the inlet of my active pump and after seeing the new modification installed on the roof of the “Atmos shelter”, our little and cozy “office” for the next weeks, we are very happy with the results! So now the smile is back in our faces! Wednesday is the day of preparation for our, hopefully, next field trip to the Plateau. A traverse of ~75 Km to be done in the Hilux for safety reasons. We have two sampling sites to visit. One from the previous season and a new site in a more challenging area in the deep Plateau to increase the resolution of our sampling. We are very excited to complete this traverse so I’ll tell you more in the next blog. That is not only a Bee Gees song. It’s also the same tempo of 100 beats per minutes at which one should give chest compressions during CPR. What do we know about Hypothermia?? Five different stages and trust me after the talk, you don’t want to experience none of them! Thank you so much Dr. Sandra for your great training and advices! These past days were full of very important and valuable lessons. We learned a lot. Briefly, when you are in the field you are not alone, you are responsible not only for yourself but also for the rest of team. After such important classes it looks like we are ready to start doing some real work. With the skydoos warm up, it is time for me and Preben to start taking care of some stuff located in the “Atmos shelter”. Here Preben has a High Volume Sampler and I have an Active pump. Both samplers are designed to collect atmospheric particles but the kind of filters we use and scientific goals we look at are different. I focus in the inorganic composition and he looks at the organic compounds. At the same time, in this shelter there are also a couple of instruments from some of our colleagues who are not here this year. That means we were trained before to take care of these devices. Preben is really good managing everything and extremely precise and organized doing his work. So, I can’t complain. I help him with what he needs and learn a lot indeed. So far, I think we are doing a great team. Nov 17/18, 2018: Arrival at the Princess Elisabeth Antarctica Station. It is time to give you news… how our adventure continues… 1 am in the morning and we finally arrived to PEA (Princess Elisabeth Antarctica Station, the Belgian Station). What a great feeling! Alain Hubert and other members of the team are waiting for us. They welcome us very kindly and give us the first indications and rules about how everything works here. After a cup of warm tea, it is time to rest a little bit. 7:30 am we need to be back for our first official meeting and meet the rest of the crew. Tired and jetlagged or excited or with a combination of everything, we make our way to our bedroom. It is a blue container outside the station that will shelter us for the next 5 weeks. In case you are wondering, it is heated, of course! The morning of Saturday November 17th, after breakfast, Alain Hubert (the famous Belgian explorer and chief in charge of the Station) gave us a tour showing us the entire station, explaining in detail about the management and functionality of PEA. I must to say, it is incredible what they have built so far. It is a place with all the facilities you can imagine and a completely zero emission station is the goal for the next coming years. Water Engineers, Electricians, plumbers, constructors, technicians, etc… are part of the crew responsible every day of the running of PEA but we all have duties that help for the right development. I feel very delighted to be part of this, at least this year. The day is almost over and everybody is excited because Sunday is day off! So now it is time to enjoy dinner and some beers and/or wine all together. It is Sunday already and we cannot wait to go outside and explore the surroundings of PEA a little bit. Always following the field guides, they take us for a tour to the “wind scoop” of the Utsteinen mountains. We are six and for me is the first time walking in the ice using crampons. Landscape is incredible beautiful. Shapes I’ve never seen before and also sounds I’ve never heard or experienced. My eyes are just amazed for what I am seeing. I am so lucky to be here, that’s all I can think of. So, in resume, it was a wonderful experience but I couldn’t have done it without help. So, thank you Daniel (one of the field guides)! For someone without experience like me, support is very important. The next two days will be training days for us. This means medical, GPS, skidoo driving, crevasse safety, rescue, etc. So if you are interested to see how this goes, more stories later on…. Nov 16 2018: The Beauty of the indescribable -Antarctica Day 1. After several months of preparation, finally the time has come. Mixing of feelings to hear “Ladies and Gentlemen, please it’s time to get ready with your warm clothes. We’ll be landing shortly…” Minutes later after a warm clapping for the genius pilot who landed us safe, the steward said “Welcome everybody to Novo Air Base, Antarctica, Local Time is 1:00 PM.” The Boeing 757 opens its door and here we are, the BELARE /CHASE team has completed the first leg of this trip to Princess Elisabeth Station. Oh yeah ! Happy faces, at least for the ones who are the first time here! Beautiful weather today! We couldn’t ask for more to be honest. While part of the team is checking that our cargo has arrived complete and safe, the rest is taken to a “container house” to wait until the departure of our next flight, which is at 9:00 PM local time. After a great welcoming at Novo, especially for me because the Argentinean team (16 people) gave me some goodies to bring with me! That really made my day even more exciting because it was a nice surprise I was not expecting. Seated now in a smaller plane, we are ready to flight to put new home for the next 5-6 weeks. The feeling is just amazing. After 1 hr and 45 minutes we finally got the the view of the PEA !!! Unbelievable, we are here !